D&D 5e just launched this week, and you know what that means! It’s time to learn how to make a character using the new system. Watch our how-to video below, and ask us your questions in the comments. Be sure to subscribe to our channel for more D&D and gaming videos. 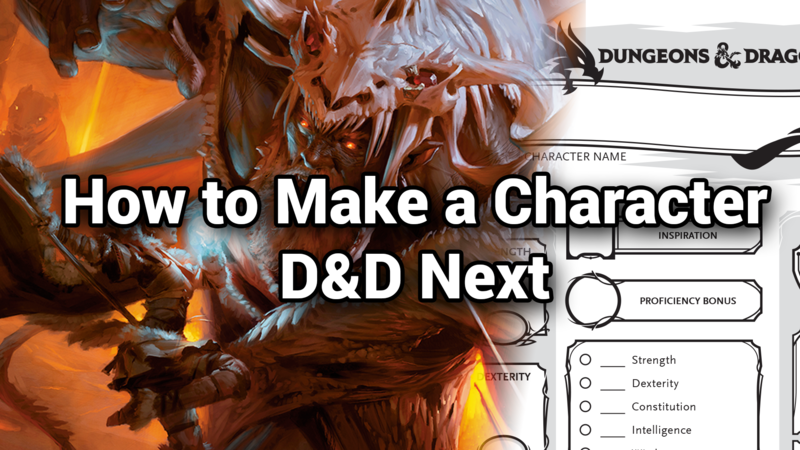 Welcome to how to make a D&D character! D&D is a wonderfully complex game and making characters is no exception. We’re here to walk you through the process by showing you step-by-step what everything means and where to write it down. You will need a character sheet, a set of 6 sided dice, and a copy of the player’s handbook to reference as you follow along. Feel free to pause the video at any time to catch up. Let’s get started! Step One: Choose a race. Races are found in chapter two. Your race determines your character’s physical characteristics, culture, and languages. It also gives you a set of other small bonuses as shown under your race’s list of traits. Picking a race affects how people will treat you in the world. Prejudices can sometimes be an advantage or a disadvantage. Next, choose a subrace. Each subrace gives you a few more bonuses and some extra flavor. Now here’s what you need to write down: First, write your race and subrace at the top of your character sheet. Second, in the section called “Features and Traits” write all of the benefits that your race and subrace grant. Some are mechanical while others are just for flavor. Step Two: Choose a class. Classes are found in chapter three. Your class is the most important choice in all of character creation, so choose wisely. 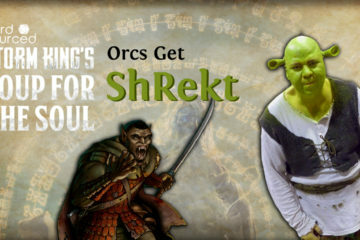 It determines your role in the party, affects your back story, and determines your play style while adventuring. Go through chapter three and read the flavor text for each class but don’t worry about any of the numbers quite yet. Write down your class and level at the top of your character sheet. Step Three: Lets crunch some numbers. Before we go any further we need to determine your characters natural ability scores. To do this you can either take the standard array which is 15, 14, 13, 12, 10, and 8 or you can roll for them. For this, roll 4 six sided dice, then add the highest three numbers together, disregarding the 4th. Write down the total, then repeat the process 5 more times until you have a total of 6 numbers. Taking the standard array gives you a set of stats that are guaranteed and balanced. Rolling stats is arguably more fun but its risky. For instance, the scores can be unbalanced and can even ruin a character if too low. Ask your DM about this. Some Dms establish house rules about rolling stats like being able to reroll the lowest score at the end or establishing a minimum total. Now you need to assign these numbers to your actual abilities. In D&D each character has 6 natural abilities: Strength, Dexterity, Constitution, Intelligence, Wisdom, and Charisma. Descriptions are on page 12. You want to to assign your highest scores to the abilities your class needs. For example wizards need a high Intelligence whereas monks need high Dexterity. You can consult the table on page 12 for a full breakdown. Now, here’s what you need to write down: First, write the raw scores in the smaller ovals within the 6 big boxes on the left. Then write your ability score modifiers in the big boxes themselves. Consult the table on page 13 to see what your modifier is for each score. Step Four: Alright now lets get down to who your character really is. First, lets give your character a name. Common names for members of your race can be found in chapter two. Now flip over to chapter 4: Personality and Background. Start by choosing one of the backgrounds starting on page 126. Base your decision on the choices you’ve made thus far. Your background reflects how you grew up, what your vocation was before you started adventuring, and what kind of lifestyle you have. They are primarily there for story flavor but each one does come with a set of benefits. Backgrounds also have 4 suggested characteristics as well as one unique characteristic. For each, you can roll a dice to determine which one you get, pick one from the list, or come up with your own. Next, choose an alignment from page 122. This indicates your character’s philosophical and ethical disposition. Use it to inform decisions you make in the game. Alright, now here’s what you write down: Your name and alignment up at the top of the character sheet. Any languages your background grants you under “Proficiencies and Languages.” And any equipment under the “equipment” section. Any skill proficiencies should be bubbled in next to the appropriate skills. Other bonuses, you can write down in features and traits. Lastly write down the four suggested characteristics in the boxes on the right. Step 5: Alright, you’ve made all your choices, now we just need to calculate the numbers. Go to the “features and traits” column. Record each of these in the appropriate areas of your character sheet. For instance, ability score increases get added to your raw ability scores. Note: these increases may alter your modifiers. For any skill proficiencies you have, fill in the appropriate bubble in the skill list. Weapon proficiencies get added to the “other proficiencies and languages” box down at the bottom. Search your character sheet for the applicable spots for all the other traits such as height, weight, and speed increases. Any others that don’t have an appropriate slot such as darkvision, just leave in features and traits so you can refer to them later. Next determine your proficiency bonus. Go to your class’s level table in chapter 3 and look up the proficiency bonus for your level. At level 1 the bonus is +2. Write this where it says “proficiency bonus.” Whereas your ability scores represent your character’s natural raw ability, your proficiency bonus represents practiced skill. Now determine your attack bonus. Attack roles use your ability modifiers in their calculations. For melee attacks you use Strength and for ranged attacks you use Dexterity. As long as you are using a weapon with which you are proficient, your attack bonus equals your proficiency bonus plus the appropriate ability modifier. Next lets calculate saving throws. Saving throws represent attempts to resist the effects of certain threats. Different threats target different saves. To resist poison it might be Constitution whereas to resist mind control it might be wisdom. Each class is proficient with two saves automatically as detailed in chapter three under your class features. Calculate each save by adding the relevant ability score modifier and proficiency bonus if applicable. Commonly you’ll end up with two good saves and four mediocre ones. Now lets determine your character’s skills. Each skill has an ability associated with it. Write down each relevant ability modifier next to each skill on your character sheet. Next add your proficiency bonus to the skills with which you are proficient. These are the ones you bubbled in earlier. Now determine the starting equipment of your class. Go to chapter 3 and write down any other equipment granted by your class features. This goes in the “equipment” section of your character sheet. For your starting gold, go to chapter 5 page 143 and look up your class on the table. To determine your Armor Class, go to page 145 and look up what kind of armor you are using on the table. Whereas hitpoints represent how many hits your character can take, armor class represents how difficult it is for your character to be hit in the first place. Each type of armor tells you how to calculate your armor class while wearing it. If you have questions about the properties of any of your equipment, reference chapter 5. If it says that you get spellcasting or cantrips at level 1, you have more to write. Some classes get to choose which spells they learn whereas others have them automatically assigned. Each class also gets spells in completely different ways. For instance, wizards prepare them from a spellbook, sorcerers know them offhand, and clerics are granted specific spells from their domains. Follow what unique mechanics your class uses for determining spells and record them on page 3 of your character sheet. Lastly we add some finishing touches. Your passive perception is equal to 10 plus your perception skill score. Initiative is equal to your Dexterity modifier at level 1. And you’re done! You can find a transcript of these instructions on our blog in the description below. Remember, this was just a crash course on the mechanics of making a character and we had to rush through a lot of things. To get a full understanding of the process, read the book and make sure to subscribe to our channel for more videos. Great video! Awesome easy to understand instructions but jeez loosen up a little in front of the camera y’all look nervous.